Outlook stands out to be the best of all the other desktop email clients available in the market. Its contribution to the business world is large, almost all the business related information are stored or dealt through Outlook. Though the main focus is on emailing, Outlook allows the storage as well as managing of contacts, calendars, journal etc. 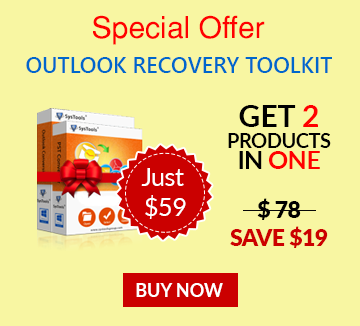 Moreover, the user-friendly and simple interface has also added to the success of Outlook. With the support of 'Add to Outlook Contacts' option seen when you right-click placing the cursor on any of the email address, makes an easy for adding the new contacts to the contact list. However, many of 2013 version's users are fed up in searching this particular option. This article is discussed based on the study that showed the many of the users are searching and querying for the missing of 'Add to Outlook Contacts' option. "After reading or replying to an email, I used to right-click on the email address to add the id to my contact list. Thus, the time was saved. But, recently after shifting to Outlook 2013, I'm not able to see the option any more. Why is it?" Let us discuss on it in the coming session. Why 'Add To Outlook Contacts' Missing In Outlook 2013? When you go for adding the contacts to Outlook contact list in any other version of Outlook, you will see the option right there. However, in Outlook 2013 this option is missing when you try to do it. The missing of the option doesn't mean that the option has got removed from Outlook 2013. 'Add to Outlook Contacts' will be visible only when that particular contact does not exist in your Contacts list preserved. Apart from that, one more reason contributes to missing and is the connection of Outlook with Facebook and LinkedIn. For the senders found in LinkedIn or Facebook, users won't see 'Add to Outlook Contacts' option. If you have already the contact of the person in the Contacts folder then, while right-clicking you will find 'Edit Contact' and 'Open Contact Card' options only. As said above that, if the sender is found in social networking platforms like Facebook or LinkedIn, the option will be missing. But, it doesn't assure that the contact will be there in the Contacts list of your Outlook. In-order to save the contact to the list, user can open the Edit Contact window and save it. Once, when you have saved the contact found from Facebook, on next switch to see the Contact Card, you will see the source name different. Till now, you we have been discussing of Outlook 2013. 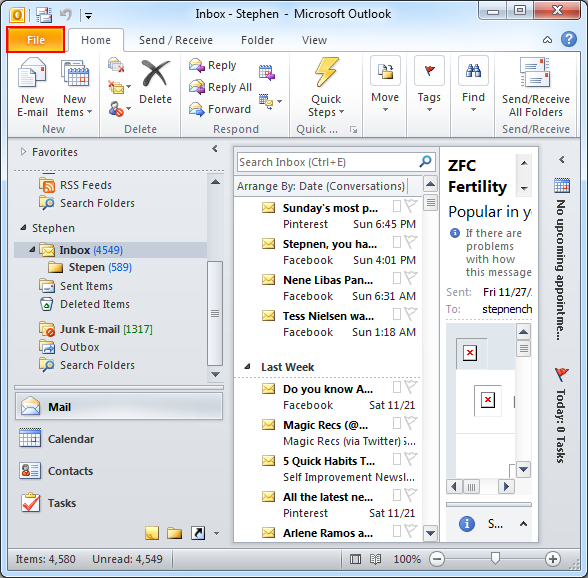 But, the missing of the option is seen in Outlook 2010 as well. The missing of 'Add to Outlook Contacts' is clearly seen in 2010 version too. Here, it may be because of some Add-ins in the Office program. How can this be resolved? Let us see the resolving step-wise. Start the Office program through Safe Mode. If the starting in Safe Mode doesn't solve the issue then, it may be because of third-party add-ins. Try to disable all add-ins by following the steps given below. Run Outlook and click "File" menu. Go for Options > Add-in. then, press the "Go…" button in Manage. Check for add-ins and clear them. Close and restart Office program. Check the Add-ins again after restart and if still fails, repeat again. Even then the issue appears, determine which add-in causes it and disable it. 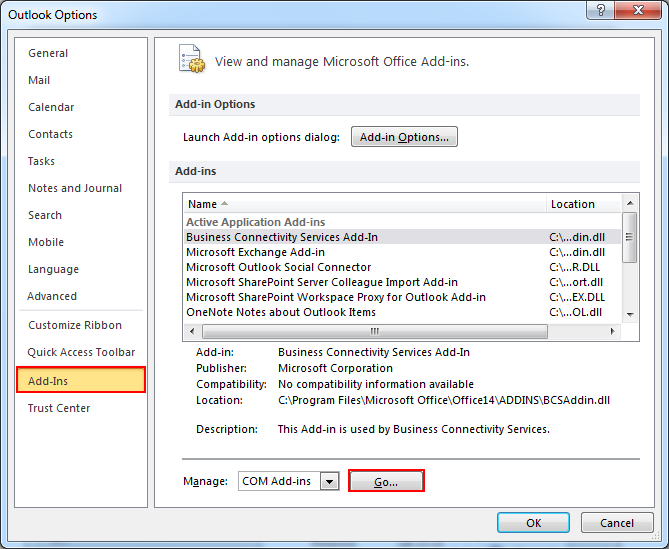 Hope the above session might help you with solving the issue of missing 'Add to Outlook Contacts' option.